ocated in the hearth of the Riviera Maya, our resort lies on a one km long white sandy beach that is very safe and excellent for morning walks or jogging. 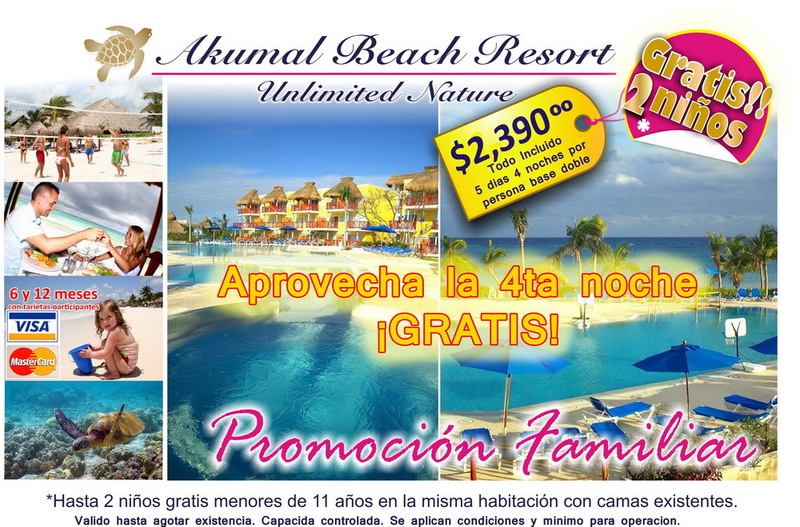 Combined with the turquoise blue waters, Akumal Beach Resort will truly make your stay a dream vacation. Our fantastic location allows you to easily visit places like Puerto Aventuras Golf Club, the natural aquarium of Xel-Ha and numerous wonderful cenotes. Relax in the comfort of our beach front resort. All the 241 rooms come with balcony or patio . Accommodations at Akumal Beach Resort consist of 73 ocean and garden view rooms located in 4 two story buildings, and 168 oceanfront rooms located in separate 3 story buildings. have one king size bed or two double beds, individual controlled air conditioning and ceiling fan, direct dial telephone system, satellite tv, private bathroom with shower, hair dryer and in-room safety deposit box. are all beach front in buildings parallel to the ocean. Rooms feature one king size bed or two double beds, A/C and ceiling fan, direct dial telephone, satellite tv, private bathroom with shower, hair dryer and in-room safety deposit box. Rates are per person, per night for the all inclusive package (AI). CHILDREN: 1 - 5 years no charge. 6 - 11 years (see rates below) maximum two children per room with two paying adults. ALL TAXES INCLUDED. PRICES ARE IN USD.